All-in-one, the ultimate solution for on-site jobs: comfortable, fast and easy to program. - 2 dwell levels of temperature. - Light and easy to handle. Flight case included. - Different electrical configurations available. Pressure Airbag - 2.5Bar (36PSI) Max. Heating Teflon heating elements - 200º C (392º F) max. All the models may reach up to 2,5 Bar pressure (36PSI), but Gamma 1500, 2 Bar (29PSI) maximum pressure. The technical data shown are subject to change without notice. Made of aluminium. Available for 6 different widths of belt: 400, 600, 800, 1000, 1200 and 1500mmn. The press includes pneumatic pressure system, heating system and air cooling system, together with a clamping system for the belt. The press is divided into 2 parts (top and bottom); each integrates stainless steel platens with Teflon heating elements and temperature probes. Length of the platen: 160mm. Completely automatic process programmed from the built-in controllers (pressure, heating, dwell time and cooling). 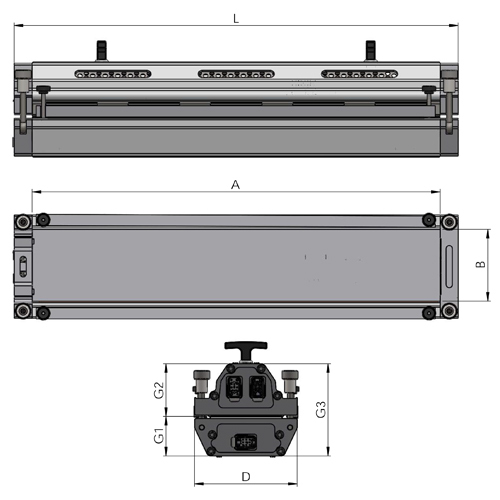 The press is supplied with a flight case with 4 multidirectional wheels and a handle. Built in the frame of the press and easy to program. Automatic control of the whole process of joint, once the melting temperature of both platens, the dwell time, the cooling temperature and the pressure have been set. Automatic end-of-cycle buzzer. The pressure is supplied equally by means of a wide section airbag inside the bottom frame. 2,5 Bar maximum pressure (2 bar for GAMMA 1500). All the models include compressor, pressure switch and deaerator. Fast heating of both platens by means of teflon heating elements. Each one is made with an asymmetrical winding to supply an even heat distribution all along the belt. The elements get warmer on the ends to compensate the loss of temperature and avoid heat concentration in the middle. Temperature programable up to 200º C / 392º F.
The cooling system consists of several high-performance fans placed on the top frame. They activate automatically at the end of the dwell temperature process. The belt is fixed by means of a clamping bar built-in the frame. Easily adjustable to different belt thicknesses. Steel made with safety factor 2 (capable of withstanding twice the maximum load pressure of the press). - Enter the parameters of each job. - Access to the previous settings or save new ones. - Display real time data of the whole process, as well as the simultaneous graphic representation. - Store information of each work (splicing parameters, type of belt, fitter, customer…). In such a way, you will be able to optimize the following Jobs and minimize the setting time. - Provide PDF reports for your own data or deliver to customer. Wooden flight case for an easy handling and protection of the press. Thank you for your inquiry. We will reply you as soon as possible. Send us your inquiry and we will contact you as soon as possible. The e-mail address supplied is not correct.